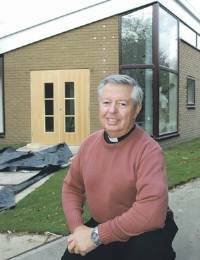 A Ponteland church hopes more residents will get to know thy neighbour when its new meeting place opens. Over the past six years, fundraising efforts, grants and donations have raised about £168,000 to enable the Ponteland United Reformed Church (URC) in Broadway, Darras Hall, to make changes to the building. The existing hall has been refurbished, the vestibule has been opened up and now the main part of the project — an extension from the vestibule to create a dedicated community meeting place, costing about £113,000 — is almost complete. This will build on the extra services and activities it has done for many years such as a daily pre-school nursery, lunches for the elderly and concerts, as well as the popular coffee lounge, set up a few years ago to run for four sessions a week. Chairman of the project team Colin Scott said: "Darras Hall is seen as a place where people live and go elsewhere to do things, rather than a community, so we felt it was important to do something to bring residents together. "When we opened the coffee lounge, we had a good number of young mothers and elderly people coming along and others who were walking past the church popped in to have a look, and this meant people who didn't know each other before were able to chat. "We have done this at a steady pace, but we are delighted that the meeting place is almost ready and we are grateful to everyone who has donated, including the main URC, church members and individuals across the North East." He added: "As regarding the future, we expect that the facilities available will encourage more members of our community to bond together through activities — both secular and spiritual." The meeting place will be open between 9am and 5pm, from Monday to Friday. It will provide a range of refreshments and people will be welcome to take part in activities planned for the coming months, such as craft and film groups. A £250 grant from Ponteland Town Council will help to equip the space with a coffee machine and comfortable furniture. An opening ceremony will take place at the church on Saturday, November 7, from 11am.